Calling all British designers...Liberty of London needs you! That's right,you heard it correctly...the institute which is Liberty Department store of London is looking for new talent in a type of liberty craft factor! Visit the link above and get ready to impress the panel on February the 6th. Good luck! 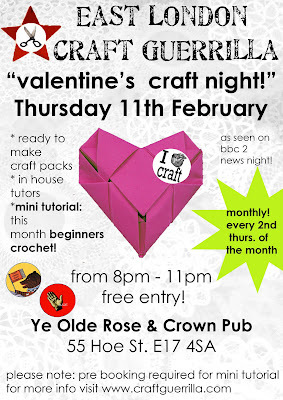 Join us at Ye Old Rose and Crown for our very special VALENTINE'S D.I.Y. Craft Night! It's a short hop and a skip from the tube station so no excuses!!! Thursday 11th February from 8pm. Free entry! D.I.Y. craft packs,in house tutors and guest tutors plus a few extras like one off workshops... please check the blog for updates! We have a few Valentine's inspired craft packs which you can make or gift as is so your honey can craft to their hearts content...ah you love filled crafters we know how much you heart craft so here's your chance to spread your crafty love! This month the mini workshop is part of a bi- monthly three part workshop starting in February on learning how to crochet and crocheting using upcycled t-shirt yarn. FEBRUARY: Learn to Crochet Part 1 - Making the base Chain & make a simple crochet chain bookmark . APRIL: Learn to Crochet Part 2 - Learn how to make single and double crochet stitches & make a simple crochet and button bracelet. JUNE: Learn to Crochet Part 3 - Learn how to crochet in the round & make a simple 1960s inspired pill box hat or fascinator. Places will be limited to ensure that participants get the most out of the workshop and costs will be £5 per workshop. Details regarding materials will be sent nearer the time. Please email info@lisamargreet.com to ensure your place on the workshop. It will operate on a waiting-list system if the workshop gets booked up and if demand is very high then we will arrange additional dates. We are no longer holding our D.I.Y. craft nights at the Make Lounge due to a slimming down of numbers of available craft guerrilla tutors. Please be aware that the Make Lounge D.I.Y. craft nights are not held by us! If you're between 16 and 19 years old and live in Birmingham...Come along to Craft Space and Yarn Storm with the Craft Guerrilla! 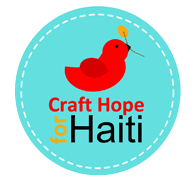 If you'd like to donate items for the charity sale please contact them through their web shop but if you're looking for a gift for someone and you love HAND MADE then this is brilliant...shopping and helping the Haitien survivors in one generous swoop. *drum roll please* Miss Siobhan Watts!!! Congratulations lucky lady,you're prize will be posted out soon. If you haven't won don't worry as you'll have a few more chances. We've plenty of goodies to gift to you ...why we wouldn't want to celebrate our birthday on our own so that's why we're spreading the joy! So here it is: THE CRAFT GUERRILLA BIRTHDAY TOMBOLA! Win a prize by sending an email with the subject title Birthday Tombola to craftguerrilla@yahoo.com and we'll enter you in our virtual draw. It's easy. It's free and you can enter as many times as you like - though a maximum of 5 entries would be appreciated ...or it will clog our in box! On offer this time is a lovely hand made snap purse by the ever so talented Peppermint Twist. But if lady luck isn't on your side don't worry because next week there is more! Keep checking the blog and twitter for announcements. It's January and TWO years ago we started the CRAFT GUERRILLA. OK we're a bit like the Queen because we have more then one birthday - we do like to party not because we think we're regal! Officially it's January but we like to milk it for as long as possible so the actual celebrations are in MARCH. To get you in the mood we'll be offering a few prizes through out this month in our Birthday TOMBOLA!!! so keep them peepers peeled!! !